Browse frozen-banana suppliers by country and region. Bananas are one of the world's most appealing fruits. A wide variety of health benefits are associated with the curvy yellow fruit. Bananas are high in potassium and pectin, a form of fiber, said Laura Flores, a San Diego-based nutritionist. They can also be a good way to get magnesium and vitamins C and B6. Available year round, portable, sweet and creamy, bananas are a convenient way to add key nutrients to your diet. 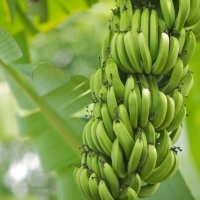 Buy bananas fresh and store them for future use. - Cultivation Type: Common - Style: Fresh - Size and packing: 9kg/carton/3-4hand, loose packing - 2240 boxes/ cont 40ft Delivery time: 7-10 days after receiving order Payment term: L/c at sight or LC 30 days confirmed by first bank If you are interested, contacting me via my email or whats app and we can start a discussion right after. Thanks for checking us out! We would love to get your feedback. Please feel free to reply to this comment with any questions about the Shell, and I will get back to you right away. IQF Banana is processing and producing with modern technology in Europe will bring to customers the products of good quality and competitive. Short on time? Let frozen-banana sellers contact you. Banana, frozen shrimp, used brick facturys. Bananas and all other fruits and vegetable from top name brands, fresh and frozen meats, non-perishable items. Fresh and frozen fruit, vegetable, mangos teen, durian, rambutan, pineapple, banana, guava, mango, lemongrass, ginger, frozen mangosteen puree, frozen mangosteen (whole fruit), frozen durian puree, green pepper, dried kaffir lime laef. Fresh cavendish bananas, frozen french fries, monster energy drink, pepsi 330ml, coca cola 300ml, egg products, frozen seafoods, chocolates, canned frozen food, frozen dried fruit, noodles, meat poultry, food products, whole frozen tilapia, whole frozen skipjack tuna, frozen fish, whole frozen yellow croaker, frozen whole chicken, frozen chicken feet, frozen chicken paws, frozen chicken breast, frozen chicken thighs, frozen chicken drumstick, frozen chicken leg quarter, frozen chicken wings, frozen pork front feet, chocolate 230g, chocolate 350g, chocolate 600g, potassium cyanide, sodium cyanide, silver liquid mercury, chicken feet, whole chicken, chicken paw, pork feet, pork ear, pork tail, beef omasum, beef tripe, duck feet. Fresh cavendish bananas, fresh and frozen mangoes, fresh and frozen pineapples, papaya, japanese okra fresh and frozen, yakitori, okra powder, moringga powder and flakes, banana powder, stevia dry leaves and powder, papaya latex, sweet basil dry leaves and fresh, onion, garlic. Squid meal, frozen squid, fruits like mango, banana. De-oiled rice bran, copra cake, chemicals, safety matches, frozen fish and shrimps, banana, fresh vegetables, poultry feeds, cattle feeds, grey sheetings, fresh mango. Wan Huat Coldstorage Trading Sdn. Bhd. Prawn cracker, fish cracker, dry salt fish, banana cracker, frozen squid, octopus, cuttle fish, indian mackerel, fish meat..